If you are looking for a holiday home with character and want to be surrounded by an authentic atmosphere, then this is the ideal destination for you! 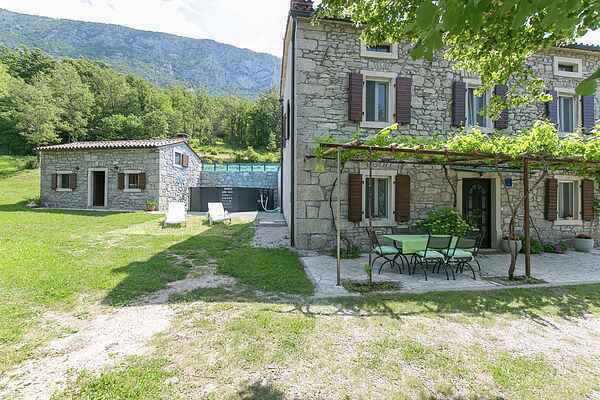 This traditional Istrian holiday home has been completely renovated and exudes complete tranquility. The house is located in the town of Kožljak, at the foot of the hills of the Učka Mountains. The nearest beach is located at Plomin (11km). A little further away is a riding school where you can go horse riding. At "home" there is a spacious garden with sun loungers and a terrace with garden furniture under the pergola. An excellent place to enjoy a delicious glass of wine and relax. An above ground swimming pool is available for the children to cool down in. Casa Baroni is spread over two floors. The fully equipped kitchen is located on the ground floor and offers you the opportunity to prepare a delicious Istrian meal. There is a mezzanine with a spacious bathroom and the first floor boasts two beautifully furnished bedrooms.